Host elegant banquets and awards dinners no matter what tables you have with attractive table skirting from Hertz Furniture. Beautiful table skirts set the atmosphere for your professional or personal event. They give any venue a whole new look in a matter of minutes. What is table skirting? A table skirt is a long piece of fabric that clips on to the perimeter of a table and can be coordinated with any theme, space or room. Available in a huge selection of colors and a variety of fabrics, all of our table skirts are custom orders, made to fit your banquet tables perfectly. 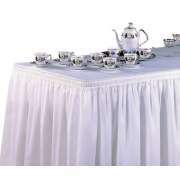 See our tablecloth page for matching tablecloths and napkins! How can you make a gym or social hall more elegant? To improve the appearance of a social hall or gymansium, you can undertake a costly renovation project that will make the room unusable for months, or reinvent the space with the right accessories. Colorful decorations and table skirts have the potential to transform a room to the point where it is unrecognizable. When students enter your reinvented gym or multipurpose room, they won&apos;t believe it is the same space they saw a few hours before. How can you dress up a folding table? When you have graceful table skirting adorning eating spaces, it doesn&apos;t matter what the surface or structure underneath looks like. You can feel free to order the most convenient and sturdy folding tables without concern for their appearance. Table skirts hide unattractive legs so no one will be able to tell that there are folding tables underneath. The right table linens can dress-up and transform any eating surface into an elegant banquet table. 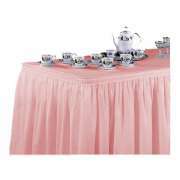 No matter what shape or size your tables are, you can enjoy the benefits of attractive cloth table skirts. Table linens that are oversized or the wrong shape can make a room look sloppy. Luckily, our table skirting is incredibly versatile. Because it is made to order, you can get a custom fit for any tables you want. Although disposable tablecloths might seem like an easier choice in the short term, they are not eco-friendly and the cost accumulates over time if you host events often. Our banquet table skirts are a worthwhile investment because they will look great through many years of special occasions and holiday parties. They can be laundered repeatedly without losing their shape or vibrancy. The shrink-resistant, no-fade fabric will serve your institution well. What color table skirts should I get? 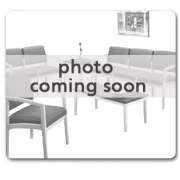 With Hertz Furniture&apos;s huge selection of table skirting, you can have almost any color you want. Families, clubs and committees that are arranging special events will enjoy having the freedom of a wide selection of decor colors. Because table skirts are budget friendly, you can order a few sets of colors so there is always a variety to choose from. If you use the same black table skirts for every event, people will quickly become bored of looking at the same colors. With a selection of table skirt hues, your space can take on a whole new life with a unique flavor at each and every event. How do you choose table skirts? When ordering table skirting, it is important to pay attention to the material as that is the greatest indicator of how long it will last and maintain an appealing appearance. 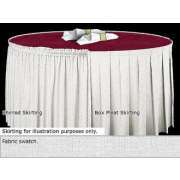 We have fabric table skirts that are made from light spun polyester, dark spun polyester and woven polyester. Spun polyester is a great choice because it will not shrink and does not require any ironing. You can simply pull it out of the dryer and clip it right onto your tables. Another factor to consider is the style of the fabric. Shirred table skirting has a lighter, more flowy appearance, while box pleats create elegant lines. Fabric with a tuxedo stripe has a bit of extra flair that might just provide the unique touch you are looking for. All of these styles are appropriate for formal occasions. You may even want to order a few so event hosts can choose what they prefer each time. How do you attach table skirting? Worried about table skirts falling off and revealing folding table legs during an event? We offer two attachment options, both of which are secure and reliable. Table skirts can be fastened around your tables using a table skirting clips or velcro which will keep it firmly in place for the duration of an evening. At Hertz Furniture, we know how big of a difference the little touches of elegance can make when planning an event. Our table skirts provide you with budget-friendly delicacy that will help you create a unique style at every banquet and celebration. Whether your prefer classic rectangle or round table skirts, we can accommodate your needs. To ensure that you are measuring accurately and ordering the right amount of table skirting, contact the Hertz Design Center for free project-planning advice.